Spray foam can save you up to 50% on your utilities compared to tradition insulation, when installed properly. Spray foam can be applied over most surfaces including concrete, wood, steel and most roofing systems. Traditional insulation does not seal the stud and wall cavities. Spray foam on the other hand seals the cavities from both vapor and air infiltration. When used on interior walls, spray foam can create a sound barrier between rooms. For multi story homes, it can be applied in the ceiling to help dampen sound to bedrooms or other second and third story rooms. By stopping moisture infiltration, this helps to prevent mold build up not only in the wall cavities, but also throughout the home or building. 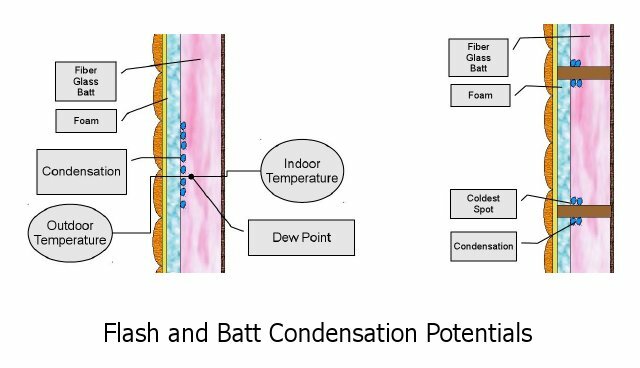 In order to provide "spray foam" services at a lower cost, a method called "Flash and Batt" was invented. The lower costs can be intriguing at first. However, in the longer run, this method can end up costing you thousands of dollars. Not only is this method much less efficient than tradition spray foam, but also it can aid in moisture and mold build-up throughout your home. Closed cell spray foam is usually best for exterior walls in order to keep the cold out, and the heat in. Open cell spray foam can be used this way as well but it is not as effective at insulating your home. However, open cell spray foam is great when used on interior walls because it keeps sounds from traveling through rooms. The two products are used for different applications around homes and buildings. When it is time to begin your spray foam project, make sure to have the correct product installed in the proper places in your home. The market has become flooded with contractors across all industries trying to make their way in the recovering housing market. Often times, these individuals are cutting costs anyway they can in order to have the cheapest price and/or rate. At first, the low cost some of these contractors are presenting seem intriguing. However, they are skimping on everything from material to insurance. This could end up costing you thousands of dollars in repairs or fines. Here are the standards we built our business on. Now that you are educated in spray foam, and have done your research make sure to ask you contractor exactly what they are doing before work begins. Find out what material you are paying for because as we now know, not all spray foam is created equal. When installed properly, spray foam can save you thousands of dollars through the years you live in your home. However, if not done properly, it can also cost you thousands of dollars. A good rule of thumb is if it sounds too good to be true, it probably is!